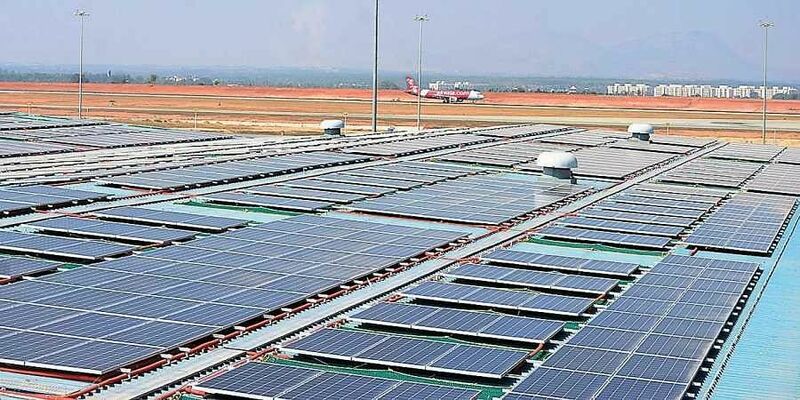 Gearing up to run the Kempegowda International Airport (KIA) here entirely on the green, renewable energy, the airport operator on Wednesday launched a 3.35 MW rooftop solar power project. The plant will generate 4.7 million units annually. Installed across eight rooftops within the airport premises at Menzies Bobba, Air India SATS, Coalport, and several BIAL office buildings, the plant is expected to reduce 3,800 tonnes of CO2 emissions annually. The solar panel design ensures the glare of the sun is not reflected, thus avoiding any visibility intrusions in aircraft operations. Lakshminarayanan S, Vice President Engineering & Maintenance, BIAL, said KIA is well on course to achieve its goal of becoming 100% renewable energy powered by 2020. “The airport’s consumption of solar power stands at 50 million units through on-site and off-site solar Power Purchase Agreements (PPA) to meet 67% of its annual energy requirements,” he informed. BIAL’s solar project was commissioned across two phases. During the first phase in 2017, 503 KW of rooftop solar, 2.5 MW of ground-mounted solar and 425 KW of car parking solar power installations were undertaken. In the second phase, besides the 3.35 MW installation by Sunshot, BIAL purchased 20 MUs of solar power through open access from Bosch plant with a capacity of 14.4 MW. This plant was commissioned in Belagavi. BIAL also purchased 20 MUs of solar power through open access from Cleanmax. BIAL has converted its street lights, perimeter lighting and airfield lights to LEDs. The projected energy generation from the solid waste management plant (to be launched later this year) will have the potential to power 5,000 households a year and will produce 1.5 million kg compost annually. BIAL Chief Executive Officer, Hari Marar said the existing 400 High-Pressure Sodium Vapour Lamps (HPSV) on the airside have been converted into LEDs. The new installation deployed across 536,00 sqm on the airside will help KIA save 11.5 lakh units of electricity annually. Harvesting rainwater through large underground tanks of 1.7 million liters capacity, building five inter-linked harvesting ponds inside KIA, treating and reusing water, BIAL has a plan: To fully water self-sufficient by 2020. The ponds, covering 70 acres, will harvest over 750 million liters of rainwater per annum. BIAL has engaged the Indian Institute of Science (IISc) to suggest sustainable methods to restore its waterbodies. Six abandoned wells have been revived, cleaned and repaired. Up to 5 lakh liters of water are drawn from these open wells each day.